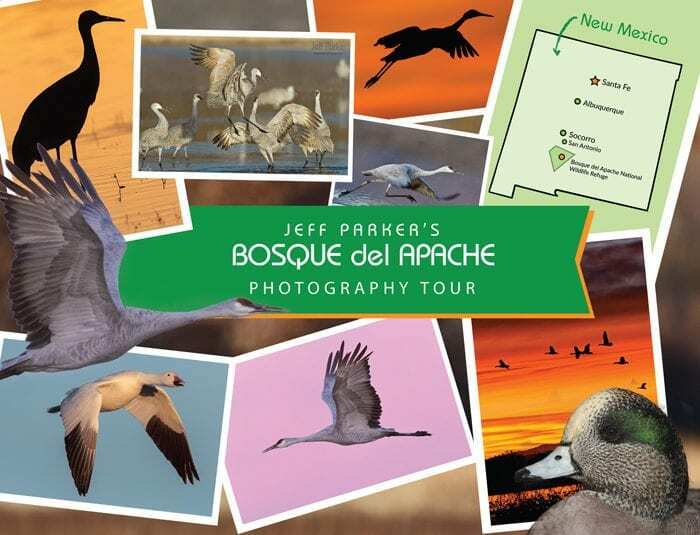 Join me for my “Bosque del Apache Photo Tour” this November — the perfect time to photograph the thousands of Snow Geese and Sandhill Cranes that fill these breathtaking skies and cold Rio Grande waters! 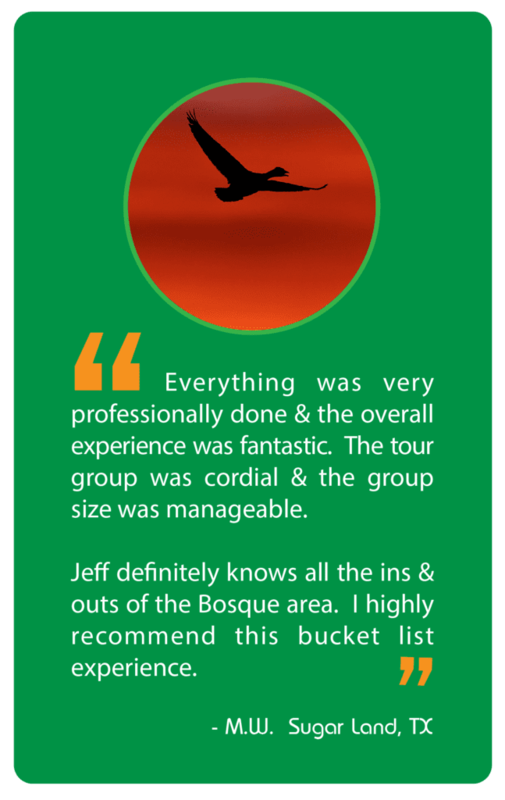 I am doing this tour a couple weeks earlier than I have in the past in the hopes we’ll get some fall color on the many cottonwood trees on the refuge. Limited to six (6) photographers ~ SOLD OUT! ~ Please email me if you’d like to be on the wait list. 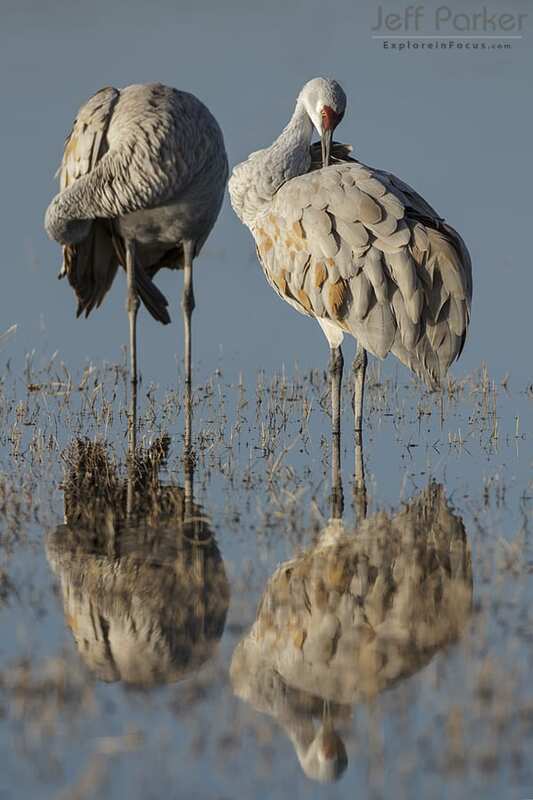 There’s a reason this national wildlife refuge is famous worldwide with nature photographers and wildlife lovers! 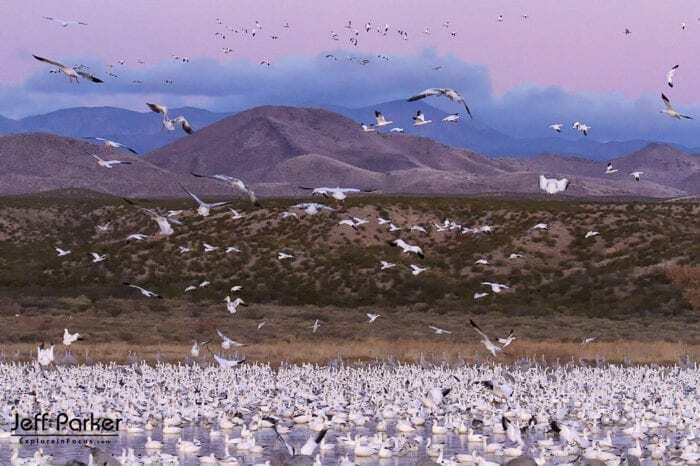 Nearly 60,000 acres of restored wetlands bordering the Rio Grande provide multitudes of wintering birds with wintertime refuge. 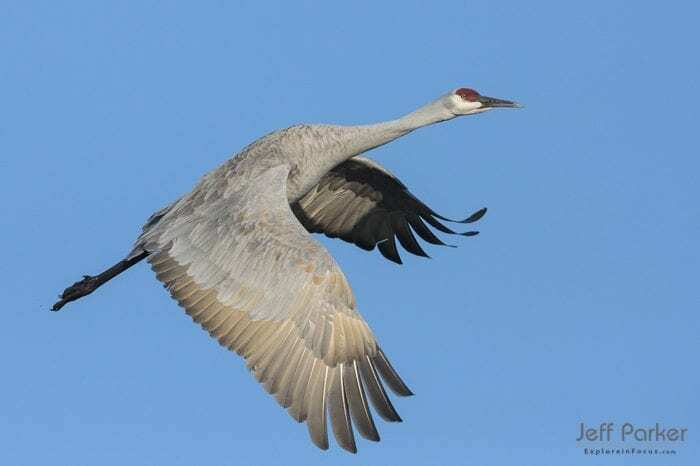 Other birds of note include: Gambel’s Quail, Pintails, American Widgeons, Mallards, Northern Harriers, Ross’s Goose, Canada Geese, Roadrunners, and –if lucky– Bald Eagles. In addition, we hope to spot the endangered Aplomado Falcon, a species first re-introduced to the region in 2006 following a successful captive-breeding program. We’ll also keep our eyes peeled for Mule Deer, Bobcats, and gorgeous, winter-coated Coyotes. 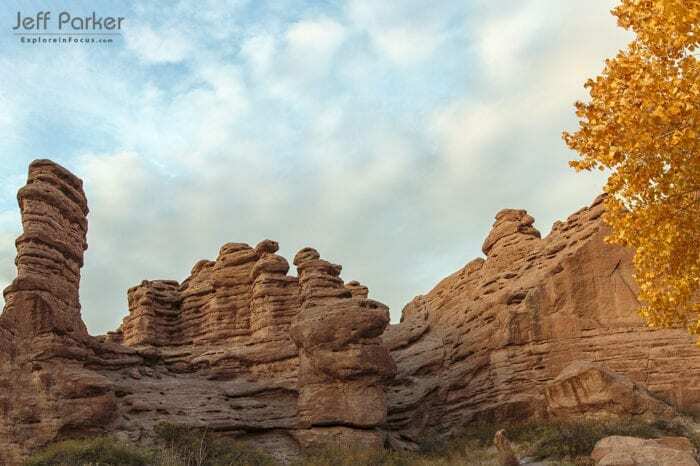 In addition to our photo shoots at the Refuge, we’ll enjoy an off-site night shoot at a unique and picturesque canyon in the region. Food* — except the dinner of our night photography/landscape shoot–Mary O will provide us one of her awesome dinners on-site. We also provide morning snacks at the refuge. Meet in Socorro, New Mexico at 7:00 on Friday evening for an orientation & get-acquainted dinner. Pre-dawn we’ll head to the refuge to get in position to catch the dramatic sunrise and awakening birds. This makes a great time to learn how to create great silhouette images. Mid-day we’ll do some duck photography with the focus on flight-photography instruction. Come evening, we’ll head back to the refuge to take advantage of the golden light as it plays upon the mountaintops. 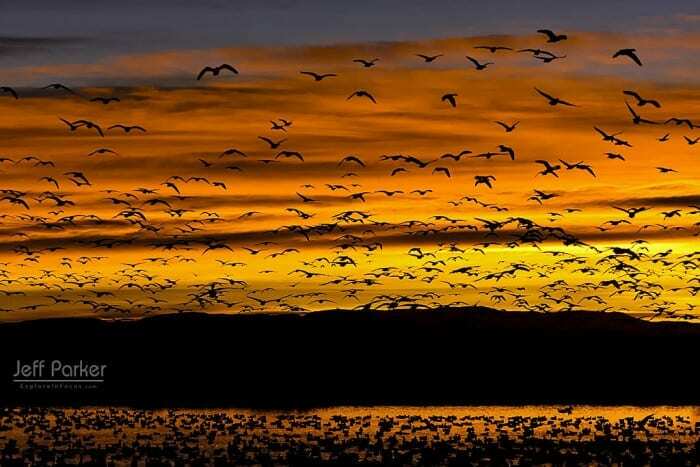 Enjoy your second Bosque morning “blast-off” and another evening capturing vivid images at the refuge, perfecting your flight photography & command over light all the while. After lunch, we’ll shoot for some image review time. Come evening, we are refuge-bound once more. Savor another pre-dawn at Bosque, as you anticipate the sunrise. Utilize your new and/or improved skills in flight photography as you capture more great images. After lunch we’ll get in some image review time for those interested. We’ll head out for our final photo shoot at a nearby canyon. 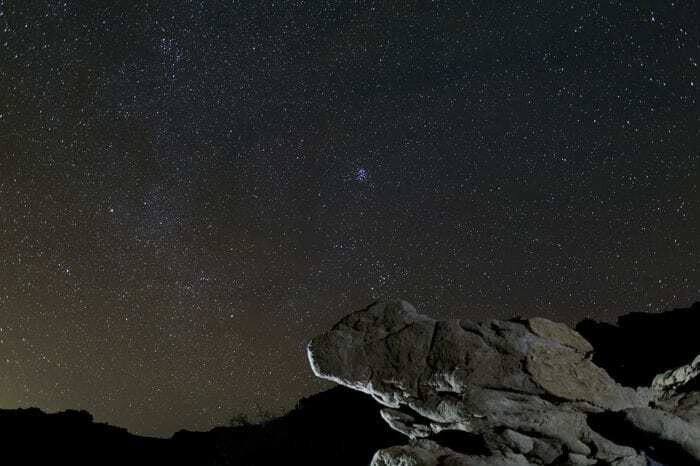 We will shoot into the darkness for some night-sky photography. Mary O will serve us one of her delicious dinners in the field. There are minimal physical requirements for this tour. You will access all shot locations via vehicle. The nearest airport and car rental is Albuquerque (75 miles). The airport there is called Albuquerque International Sunport (airport code: ABQ). Interstate 25 connects Socorro and Albuquerque and it’s pretty much a straight shot and an easy drive that only takes about an hour. The El Paso airport is 197 miles away. The code for the El Paso Airport is ELP (officially: El Paso International Airport). We will break during the middle of the day for lunch and a bit of downtime. We generally eat together but of course you are welcome to do your own thing. There are several restaurants in Socorro as well as a grocery store and super Walmart. The evening of our starry-skies/landscape shoot includes a Mary-O Meal in the field. Your tour will include an organized schedule with the names, addresses, and websites of every place we are scheduled to eat so that you can view the menus ahead of time (in most cases). And, yes…we definitely do go to one of the restaurants famous for the renowned New Mexican green chili burger! Click on this EQUIPMENT CHECKLIST (PDF) to see what equipment I suggest you bring along. You do NOT have to own it all nor bring it all. If you have any questions about suitable or minimum equipment needed, please do not hesitate to contact me. You will want to lodge in Socorro. It is about a 20-minute drive from the refuge. The nearest “town” to the refuge, San Antonio, has no lodging. It does, however, have an RV campground. I stay at the Econolodge in Socorro. They offer nice rooms at a reasonable price. Socorro is a small town so even if you stay elsewhere you won’t be far from the Econolodge. If you’re not a breakfast person, it may be enough for you that Mary O will have coffee, hot cocoa and hot water (for tea) for us in the field as well as fruit, nuts, KIND and Clif Bars. SPACE FOR: (6) SIX ~ SOLD OUT!